APPEARANCE: Pours a murky, hazy orange with golden peach hues. Unfiltered but not finding any sediment in the initial pour. Big sudsy off white head that stuck around for the long haul, Leaving nice lacing all around the glass as it slowly dissipated. AROMA: Big burst of over ripe oranges and grapefruit rind. Followed by a tropical cereal like aroma, almost like that special k with the dried fruit in it. Tons of hoppy, floral notes with a slight spicy earthiness, back end is grassy, slightly catty. Very interesting and inviting bouquet on this beer. TASTE: Wow I knew the nose had fruit on it but the taste is a tropical fruit bomb! Fresh, juicy, ripe tangerines, pineapples even a bit of berry flavor. Toasted warm bread with honey butter on it. For sure getting some heat from the abv but I actually enjoy that especially when it’s balanced out with the big bitterness from all those hops. MOUTHFEEL: Medium creamy body with a nice medium carbonation.Wonderful lingering oily finish. Super drinkable for a 9.5%. 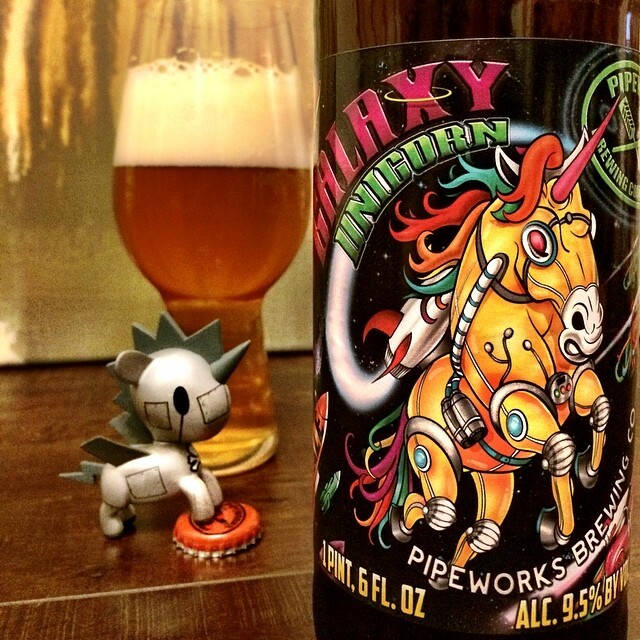 OVERALL: This was my first Pipeworks beer I thought it was outstanding,I really enjoyed the galaxy hops flavor profile. The addition of wheat was very interesting as well. I found that all the sweet fruits where balanced nicely and not over powering at all. This entry was posted in Ales/IPA, Beer Reviews and tagged #beer, #beergeek, #beerme, #beernerd, #beerporn, #beerreview, #beerzombies, #craftbeer, #craftbeerlover, #dtlv, #ipa, #lasvegas, #lv, #sincity, #zombie, #zombies, chicago, galaxy, IBU, pipeworks, Pipeworks Brewing Double IPA, tropical fruit, unicorn, vegas by beerzombies1. Bookmark the permalink.